Don Mann and Ralph Pezzullo's shockingly authentic military thriller sends Thomas Crocker and his SEAL Team Six brothers to confront a notorious ISIS general, The Viper, during the occupation of Aleppo, Syria. As Severine and her colleagues establish a makeshift hospital in besieged Aleppo, Crocker counsels caution. He knows too well that their NGO status will be no protection from the Viper, a notoriously vicious ISIS general with a deeply personal hatred of the West. When the Viper's men kidnap one of Severine's American colleagues, Crocker will pull every string at his disposal to launch a rescue mission. But in a situation where the US has no official business, he'll push every boundary of how far he's willing to go--and how far his SEAL brothers in arms will follow him--to save innocent lives. Don Mann (CWO3, USN) is the author of the national bestseller Inside SEAL Team Six and a former Navy SEAL. He lives in Virginia. Ralph Pezzullo is a New York Times bestselling author and award-winning playwright, screenwriter and journalist. His books include Jawbreaker (with CIA operative Gary Berntsen) and Zero Footprint (with military contractor Simon Chase). "As real as it gets! Hunt the Viper reads like it was pulled from official mission traffic. 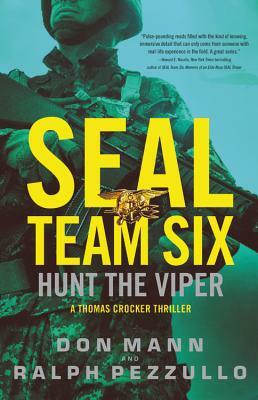 "The pace is relentless, and the inside knowledge of how the SEALs operate again gives this series its appeal. . . . For action fans, Crocker continues to deliver."